Tokyo is a crazy city of poorly planned streets, a maze of train lines and never-ending flow of people. 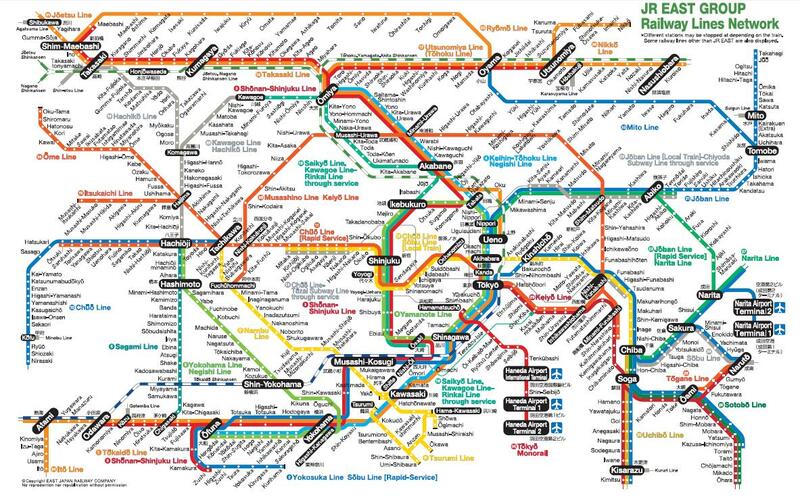 To get around in Tokyo can be a mind-boggling, energy-draining task if you don’t have maps or don’t know the secret of getting around. In many western countries, driving is the most common option, but Tokyo is already crammed up enough they don’t need you to add another car in their roads to prolong the delay time by another five minutes. So the next option is to take public transport. 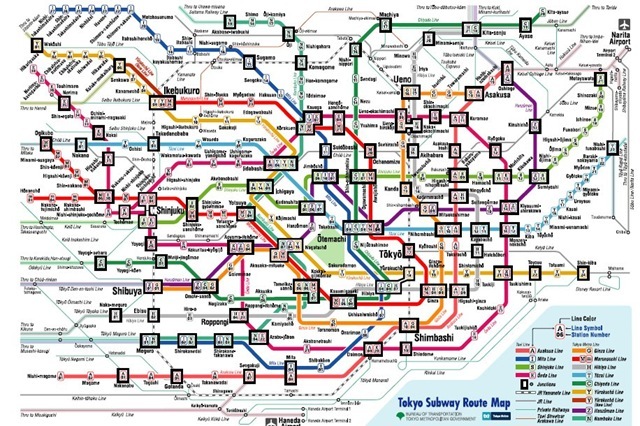 Tokyo’s giant web of public transport is very developed, in fact over-developed that you need to scrutinize on each station and line to figure out where you are, and where you are going. The best way is to squeeze into one of the train stations and into the trains. It brings you virtually anywhere you want in Tokyo. Tokyo has some 102 train lines altogether, that connects you from the city centre of Tokyo to the suburbs of Tokyo, and even to the neighbouring prefectures such as Kanagawa, Saitama, Chiba, Gunma and Ibaraki. Here are some tips of navigating in Tokyo by train. Basically, the Yamanote Line on the JR map (the green circle line in the middle) goes to many of the touristy places such as Shibuya, Shinjuku, Harajuku, Ueno, as well as connects you to other prefectures. Shinkansens stop by Tokyo Station and Shinagawa Station. Joban line (常磐線) on the the top right leads you to Ibaraki Prefecture. Sobu line (総武線) on the right-hand side takes you to Chiba prefecture, where you find Disneyland, and the Narita Airport. Tokaido line (東海道線) at the bottom brings you to Kanagawa Prefecture, where Yokohama is. Of course, there are many other lines you can take to the respective prefectures, but the above is a simple guideline for JR trains. As the land value of the commercial district is too high for train companies to build railways on ground, subway is the best option to get to the economic heart of Japan. Almost all lines of the Tokyo metro brings you through the bureaucratic centre where the parliament and ministries are, while some pass by popular tourists spots. Ginza line (銀座線) connects the olden bustling city-centre of Edo- Asakusa and Ueno, with the present-day popular hangout spot- Shibuya. It also passes by the high-class district of Ginza. Marunouchi line (丸ノ内線) brings you to the bureaucratic centre of Japan- the parliament house at Kasumigaseki (霞ヶ関) and Kokkai-gijido (国会議事堂). It also brings you to the town of music where you see rows of shops selling music instruments at Ochanomizu (御茶の水). Lastly it leads you to Korakuen (後楽園) where the Tokyo Dome is. Hibiya line (日比谷線) takes you from Ueno (上野) to the hip hangout place for foreigners and the rich- Roppongi（六本木）where Tokyo tower is. It also passes by Ginza and Tsukiji (築地) where the famous Tsukiji fish market is. Tozai line (東西線) passes by Nihombashi (日本橋）which is the first metro station in Tokyo, and to Kudanshita (九段下) where the controversial Yasukuni Shrine and Tokyo Budokan are. It also passes by one of the most famous universities in Japan- Waseda (早稲田). Chiyoda line (千代田線) takes you to Yoyogi park (代々木公園) which is a famous spot for maple leaves in autumn and sakura in spring. It also goes to Omotesando (表参道) which is a street of the chic and stylish. Once again, the list is non-exhaustive, and you could spend hours calculating all the permutations of getting from one place to another with all the lines available. When you get lost at a station, do not hesitate to seek help from the station staff. Even though they might not be able to speak English fluently, they can actually understand if you write it down. Most importantly, the staff are trained to bring you safely and surely to your destination, so do not panic when you get lost or feel nauseous from looking at the train map. Just approach the staff to ask in simple English or whatever Japanese you know. You will be fine!